TERRILL: The Urban Music Scene is excited to hear about your new album, Carpe Diem. What’s going on with that? 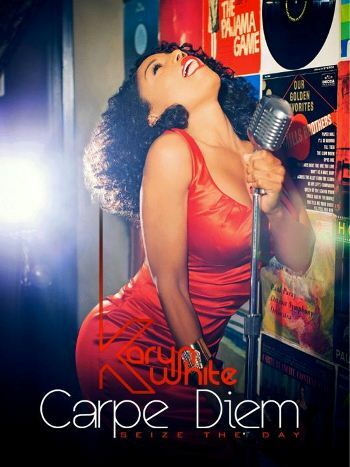 KARYN: Carpe Diem is a Latin phrase for “seize the day” and living the moment. And that’s exactly what I’m doing. I am seizing the day! I have a record after blah-blah – I don’t want to say how many years I’ve been away – and I’m excited, I’m back and, hey, I’m enjoying what I’m doing. KARYN: Oh, yeah – the “national anthem” that I’m so proud of. I’ve been raising my daughter – I just sent her to college. She’s going to Howard University and her dad is Terry Lewis (of Jimmy Jam & Terry Lewis fame). I didn’t realize that eighteen years have gone by. I never said, “Okay, I’m going to step away from the industry until I raised my daughter” but I kind of found that as the time went by, the industry was changing and I didn’t feel like I really knew what was happening. Hip Hop was very strong on the charts and I just felt the need to just step back a little bit. Being an entrepreneur, I was doing other things. I was doing interior design and building homes – commercial homes – and doing a lot of real estate ventures but I wasn’t doing anything musically. I would go on the road sometimes and then I would sit in with like Eric Bene’t and also Earth Wind & Fire – do a couple of gigs with them on the road – but other than that I was pretty quiet musically. TERRILL: That’s what’s so exciting about Carpe Diem. It’s just such a refreshing sound and a reminder of some of the great quality music you released back in the late `80s/early `90s. The quality of the overall production – the arrangements, songwriting, and, of course, your impeccable vocal skills – is just fantastic. I believe this CD is a very defining piece of your discography as well as one of the finest releases of the year. KARYN: Wow, that’s hot! You know, as an artist, I don’t have a range like Whitney Houston had, so when I sing a song, it’s like a Gladys Knight. You know how she sings with so much build…she doesn’t have the highest range. She has a warm tone…also Anita Baker. That’s just where I come from. I try to make sure that my vocals are very convincing. I won’t sing a lyric if I don’t feel it’s related to who I am and what’s real to me. Even with “Unbreakable,” the single that I’m going to radio with, I remember hearing it and I’m like, “I am breakable.” Who says that, you know? If you heard me, I break. So I kind of tweaked the lyrics. The whole thing is about never letting anybody break your spirit after you go through love. It’s got to be real to me. Thank you for the compliment. TERRILL: Oh, it doesn’t stop there! It’s also good to see that you have pulled back one of the great R&B producers of our time, Derek “D.O.A.” Allen. You know, that guy’s been around the block. TERRILL: Derek really stretched out as a producer on track number six – the interlude with the string arrangement. That’s a completely different direction. Even though the interlude lasted about a minute and four seconds, that minute and four seconds made a major impact. KARYN: Oh, it was incredible. And that temp on the back song is called “Constine and Lee” which is my parents’ middle name. They’re both deceased: my mother is Constine and my dad is Lee. I love classical music so when he came back with that, I remember myself and the writer, Bobby G. were like, “Oh, my God!” It was just magical. I’m a veteran artist but these are things you just don’t take for granted. So I’m very blessed. I am still on cloud nine about my comeback. TERRILL: You also have an E-book with the same title, correct? KARYN: Yes – Carpe Diem: Thoughts and Affirmations to Help Seize the Day. It’s encouragement. I was in the hospital and the idea of this book came to me. I had three surgeries that were not planned. I was supposed to have one surgery but then it turned into mistakes and I wound up having three surgeries in a month. I remember being at the hospital when it came to me. I started writing ideas and thoughts. This happened right in the middle of my CD project so it could have hindered me and stopped me. Then…I got what was going on. “I’m not supposed to be sick now. This is my time!” So I wound up finishing a record and a book. I thank God for words… I feel like these words are very powerful. TERRILL: You have big plans going back into the game – a new reality TV show? KARYN: Well, we’re writing it and writing it, so we’ll see what happens. My manager Jay King – founder of Club Nouveau and manager of (former Earth Wind & Fire keyboardist) Larry Dunn, Darius McCrary and myself – has a radio show. We’re always talking about what I’m doing so I’m, like, “We need to do a show about me coming back, what he’s doing and how we’re all reinventing ourselves – living in the moment, going after our dreams, over forty and getting it in! After being away eighteen years, I could have really been fearful. So I want to encourage all the people reading to please dream your dreams, live your life and don’t let anything discourage you. Carpe Diem – seize the day! You only have one life. You’ve got to go for it. TERRILL: Now are we talking about doing some touring and promotion of the CD? KARYN: I’ve already started. I was just in San Francisco. You can go on my website to look at my performances AND my rehearsals. Touring is where Karyn White lives – that’s my house. And I come from the school of being an entertainer. I admire people like Prince, Michael and James, so you got to imagine it’s going to be a straight up show. I love to perform and connect with my audience, so I will definitely be out on the road – gettin’ it in and doin’ my thing…again! TERRILL: That’s right, girl! Well, welcome back… It’s just beautiful to see you. We need more great singers like you to come back into the music industry and bring us the quality music that a lot of people have been waiting for. I believe Carpe Diem is touching on that same nerve. So I really pray God speed for you on the CD and we look forward to calling you up and checking back in with you. You want to do a part two down the line? KARYN: I would love to. And thank you! I really feel your love and support. I feed off of it. I need it! It just energizes me to keep doing what I’ve been doing. I agree with you – music is so stale. There’s no commercial music, they’re finding the same manufactured type of artist and it’s like they want everybody to be Beyonce’ and everybody to be Usher. That’s not what makes a rainbow. You need variety, you need color and I miss that in music. So I urge us all to support our artists, our independent artists like myself and other artists that are trying to really make a difference in music. I want to thank you again. I really am touched by your words. They inspire me to do my best. You can get it at iTunes, too. 3 Responses to "Our Conversation with Karyn White! | 2012"
This chick is so wack. I don’t know how anyone can truly support an artist who has been gone for 18 years. She had so much potential and just threw it all away. Nice conversation, I heard some of the tracks from the new CD – she still sounds the same. Even after all those years, she still got it.